It probably won’t come as a surprise that it was Cassidy Luteijn’s experience as a student residence leader at UVic that taught her the importance of safe sexual health. That exploration may become a whole lot safer if Luteijn is selected as a winner of the ONE Canada Design contest — a competition run by ONE Condoms — that will see at least ten artists win a cash prize and thousands of free condoms for an organization of their choice. The competition is one of the more creative Canada 150 celebrations taking place this year, the 150th anniversary of Canada’s confederation. “Winners will be chosen,” the contest rules read, “based on how well the designs . . . celebrate Canadian life, culture, and history.” Ten designs will be chosen based off of public voting, and the ONE Condoms staff will select other winners as well. Hundreds of Canadian designers have seized the opportunity and submitted a number of hilariously thematic designs, drawing up prophylactic covers adorned with Canada geese, poutine, and maple leafs. Among some of the more notable designs is a cover with a maple syrup tree tap that reads “I’d tap that”; “Mount One” says another featuring a mounties’ hat; and another depicts a smiling caricature of Drake accompanied with the phrase “I’m a wrapper”. Luteijn, a third-year visual arts student at UVic, is one of those artists. She submitted her designs on a whim, and was amazed when she was informed she’d made it to the top 50. 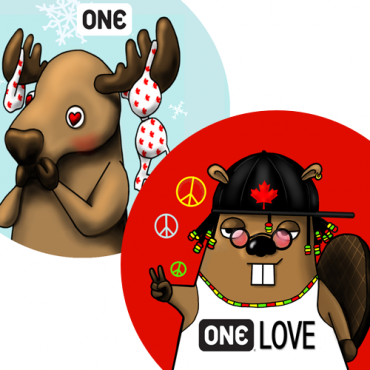 Cassidy’s two designs — a hippy beaver with a “one love” t-shirt and a heart-eyed moose with underwear on its antlers — were first selected by ONE Condoms to make the top 100 before a panel of judges chose her designs for the top 50. The public now has the chance to vote on which designs they like best, and a top 10 will be chosen to receive prizes. It’s a novelty competition, but Luteijn recognizes the importance of easily accessible contraception. But while many people (Luteijn included) find the idea of a condom design competition both hilarious and helpful, Luteijn, an Abbotsford-native, has found that people are still uncomfortable talking openly about sexual health. “It was really nerve-wracking for me to have it posted [information about the competition] so blatantly for a lot of my family members that are quite religious [to see],” Luteijn says. “So it’s been a little bit — I’ve been trying not to let it take away from me being excited. “I think it’s moreso just having to grit my teeth and bear it,” she says. “[Listening to people ask], ‘Oh, so what is this for?’ [I] kinda just have to cringe a little bit and tell my grandparents that I’m designing condom wrappers for my degree that they’re helping pay for. Luteijn realizes the designs are doing a social good, and that a more serious conversation about sexual health is incredibly important to society. With that said, she can still find the humour in the whole thing. You can vote in the ONE Canada Design Contest by visiting onecondoms.ca and clicking the “Do it for Canada!” banner.